Paver patios are a beautiful alternative to a concrete patio or a deck. They are popular, attractive, affordable, durable, and require low maintenance. A paver patio is easy to install and can usually be done in a weekend. Pavers can be used for a patio, driveway, walkway, or porch. Prepare for your patio installation using our installation guide below. The average cost to have a paver patio installed is $8 – $20 per square foot. You can save some money by doing the expensive work yourself. Be sure to prepare and get the right material to install your patio. There are several tools required to install a patio. Before you begin the installation you’ll need to thoroughly plan and lay out the area. Before you do any digging, call to have buried utilities, such as electrical, gas, and cable, phone, and water lines marked out. This essential safety step is often a free service and usually requires a single call. With buried utilities marked you can start to layout where the patio will go and mark out the boundaries. Use marking paint to layout the perimeter, then add stakes and mason string so the line will be permanent. 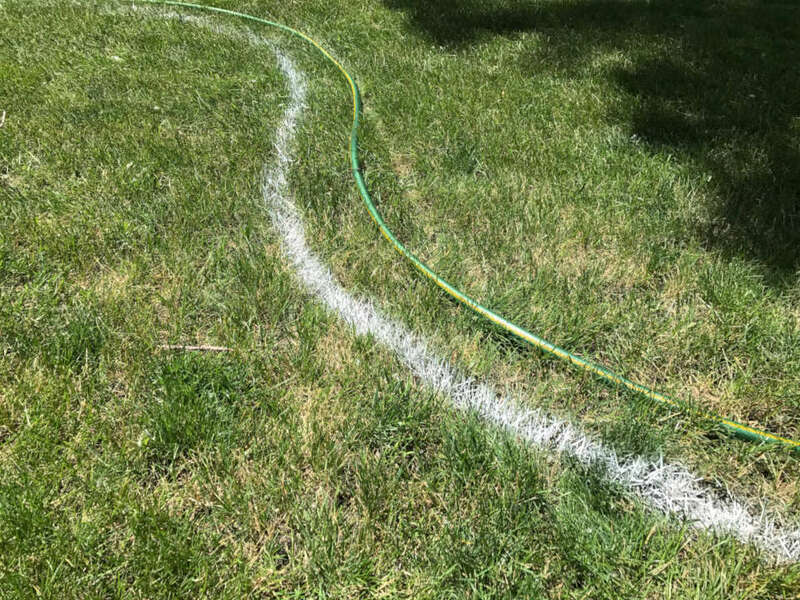 If you’re layout out curves you can use a garden hose to lay out the curve, then mark the patio using paint when the curve is just right. Patios need to be pitched by about an inch from one end to the other to allow water to runoff and drain. Determine the pitch and align the mason string to that pitch. For example, if your mason line is 6″ above the ground level on one edge, make it 5″ above ground on the other so you can install the pavers at a pitch for water runoff. Once the size of the patio has been determined you can order materials. 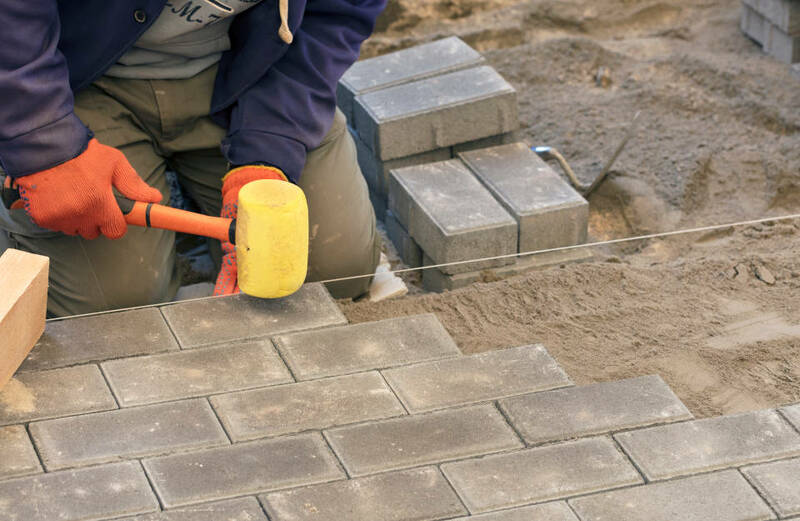 You will need to calculate how many pavers you need to fill the space by finding the square footage of the patio and the square footage of the paver, then divide to find how many pavers you need. Use our paver calculator to easily find how much you need. You also need to estimate the amount of gravel and sand you will need for the base of the patio. You will need to determine the final height of the patio. Start by finding the thickness of the selected paver, then add 1″ for a layer of sand and 4″ for a layer of gravel to the thickness of the paver. It’s often a good idea to elevate the patio slightly above the ground so that water can run off. Use the mason string from the layout to determine the depth of soil to remove. 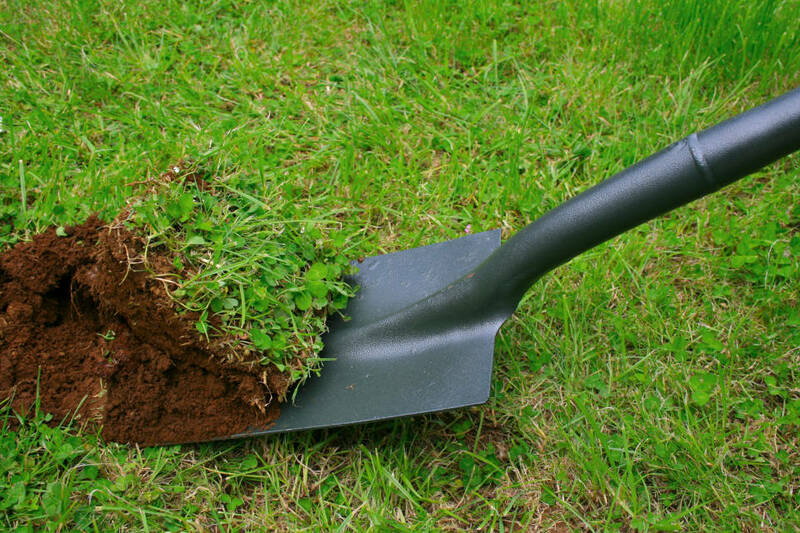 Dig the area using a shovel then tamp to compact the soil. 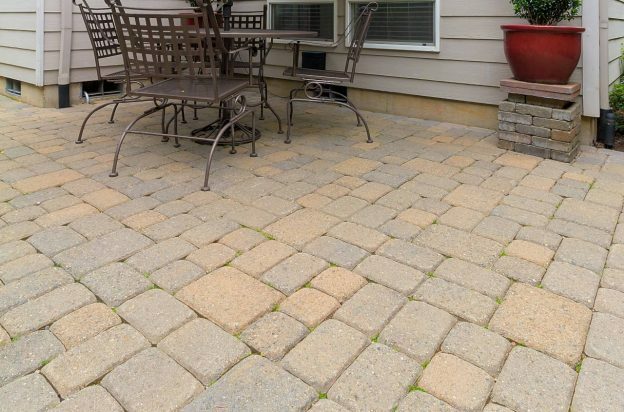 When you are done your patio area should be about 6-7″ deep, depending on the thickness of your pavers. After the excavation is complete add 4 inches of crushed gravel and level the surface. The distance from the mason string to the top of the gravel base should be even around the perimeter of the patio so the surface to be flat. You’ll need a 4-inch layer of gravel for the base. Use our paver base calculator or cubic yardage calculator to estimate how much you’ll need. 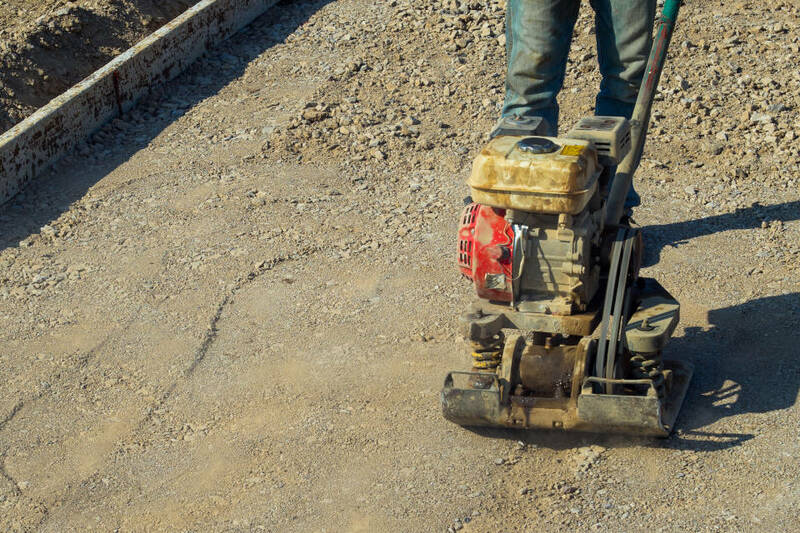 Be sure to compact the gravel patio base using a tamper or a plate compactor. You may need to rent the compactor, but for even a moderate sized patio it will be more effective than a hand tamper and save hours of back-breaking labor. This step is crucial to prevent the patio from settling and to allow the proper drainage. Verify that the surface is level and an equal depth below the mason string, adding additional gravel to low spots. After the gravel base is level and compacted, add a 1 inch layer of sand, then compact again. This layer should be a precise depth below the mason line and will be the final layer that the pavers are set onto. It is important that this layer is perfectly flat. Many people recommend screeding the sand by embedding a few 2x4s or pipes in the sand and pulling a board along those to level the surface. Whatever your approach, the surface needs to be perfect or you will see imperfections in the patio. With the sand and gravel base complete, it’s time to set the pavers. Place them evenly in the sand making sure the surface is flat. 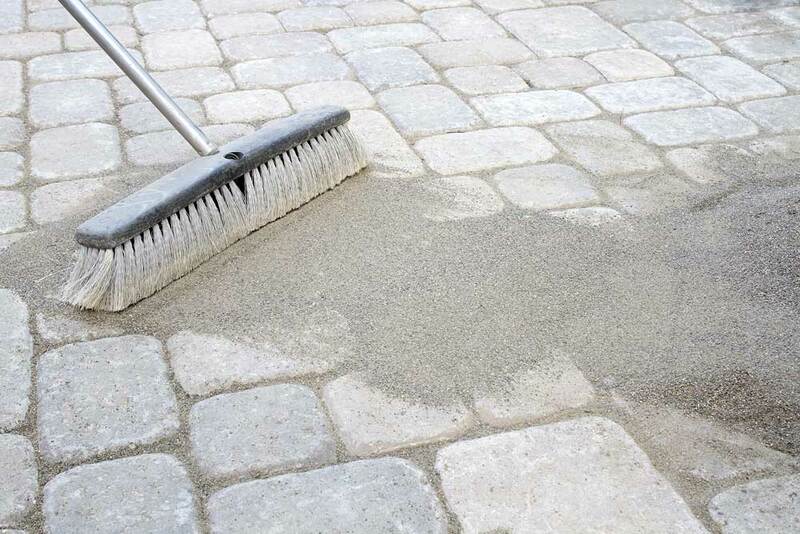 Set them tightly, but not so tightly that each paver is displacing sand as this can cause the surrounding pavers to rise. This step will go fast. When you need to cut the pavers, consider using a masonry blade attached to a circular saw, which can be purchased at your local home center. You may want to add a plastic edging to lock the edge of the patio from moving, depending on your installation. At this point your pavers should be set and the patio should look beautiful. It is important to add a layer of polymeric paver sand in the joints. This locks the pavers together so they don’t move and prevents weed growth. Sweep the sand into the joints and remove any excess. After the sand is applied use a hose and garden nozzle to wash the surface. This cleans the pavers and starts a chemical reaction in the polymeric sand causing it to fuse together. Our polymeric sand calculator will provide an estimate for how much of this you need to finish the patio. After the sand has been applied to the joints you can seal the patio. This enhances the beauty of the patio and prevents staining of the pavers. Sealer is usually applied using a paint roller. Installing a paver patio is an affordable way to add beauty to your yard! The right planning and preparation will make the installation go smoother and the end result longer lasting. Pro Tips Get more pro tips for your patio installation to ensure your project goes smoothly.